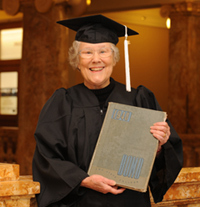 A northwest Iowa native will claim her diploma from Iowa State University next weekend, 60 years after dropping out of I.S.U. Shirley Smith, now 79-years-old, quit school after her sophmore year in 1949 to get married. Shirley and her husband Vic lived in married student housing on the I.S.U. campus while he earned his chemical engineering degree. The couple ended up having seven children – all girls. In August of last year, Shirley and Vic left their home in Oregon and moved back into married student housing at I.S.U. Shirley says she always dreamed of returning to Ames to finish what she started 62 years ago. “We are big Iowa State fans and since I went my first two years here, it worked out very well because I was able to use my credits from those two years and I came in as a junior in August of 2008,” Smith said. In 1949, Harry Truman was president and Duke Ellington played the I.S.U. Memorial Union. Smith says attending college today is much different than it was six decades ago. 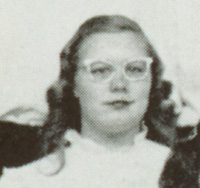 Her classes this time around required more writing – primarily on a computer. “Another change is the cell phone,” Smith said. “All of the kids are on their cell phones, ipods and that sort of thing all the time. That was totally different. I think they’re missing out on a lot of communication that they could be doing in college.” Despite the generation gap, Smith says she’s bonded with her fellow I.S.U. students. “I’ve made some really good friends…people that I would like to stay in touch with to find out what they do with the rest of their lives,” Smith said. Smith has befriended some classmates on her Facebook page, which she mainly uses to keep up with her family. She now has nine grandchildren and four great-grandchildren. Smith looks forward to returning to Oregon with her husband, after they attend two graduation ceremonies this coming Friday and Saturday. “I’m not going to miss a thing,” Smith said with a laugh. “I’m going to put my cap and gown on and really enjoy it all.” Smith, who grew up in Marathon, Iowa, will graduate with a degree from the I.S.U. College of Liberal Arts.